Love requires us to think of terrorists as people. We need to look beyond terrorist acts to the exploitation of powerless countries by the West. A memorial to the victims of the Paris terror attacks. Credit: Demotix/Michael Debets. 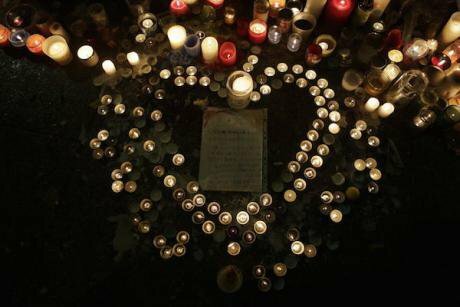 In the aftermath of the terrorist attacks in Paris last month, amid all the talk of war and destruction, some people could be heard calling for love. But what would a loving response to terrorism be? I understand love as a concern for all people, which has well-being as its first focus. It is, importantly, opposed to what Martin Luther King Jr. describes as “the barbaric consequences of any tribal-centered, national-centered, or racial-centered ethic” – of which terrorism and its causes (many of which the West is responsible for) provide us with numerous examples. Terrorists try to hijack our emotions; for this reason, we should be wary of allowing our emotions to dictate the ways in which we respond to terrorism. Terrorists want us to feel shock, outrage, insecurity: terror. The manipulation of our emotions is integral to their strategy. Intellectual engagement can support us in responding reasonably to terrorism. Terrorists know that causing fear is an effective way to engage our attention. They believe, with good reason, that by assaulting our emotions, they can provoke us into responding in hateful ways – in ways that ‘justify’ violent action, not only to other people, but to themselves. In July, Transformation republished an article by Max Harris and I outlining a values-based politics of love. I think that the politics of love we sketched can help us to think clearly about how we should respond to terrorism. A loving response to terrorism would be proactive, rather than reactive. It would see us responding to the causes of terrorism, rather than concerning ourselves disproportionately with terrorist actions. We should be very concerned about talk of violence and war, of, that is to say, all forms of terrorism. It is a painful fact that ‘legitimate’ states enact much more violence worldwide than non-state terror groups do. The most loving, effective approach governments could take to defuse international terrorism would be to immediately adopt peaceful processes in their dealings with other peoples. As well as demonstrating our concern for all people and our opposition to all forms of terrorism, this strategy would deprive terror groups of one of the most compelling justifications for the violence they perpetrate. A loving response to terrorism would involve recognising our interrelatedness, and taking seriously the legitimate concerns of all people, including those communities whose members are vulnerable to ‘radicalisation’, and even those individuals who commit acts of terrorism. Importantly, it would see us looking beyond terrorist acts to the causes of terrorism, namely, the ongoing exploitation of powerless countries by the West and its allies. This exploitation does not excuse terrorist action, but it does explain it. This would lead to a focus on foreign development that prioritises both human rights and relative autonomy, nurturing love between all people. It would also see wealthy nations providing sanctuary to refugees fleeing unloving situations. A loving response to terrorism would be part of a wider re-imagining of politics, and would have broad implications. It would challenge capitalism and its institutions, by, for example, requiring the reconfiguration of our profit-driven media, which has been so effectively exploited by terrorists, who understand that sensationalism sells, that the more outrageous their actions, the more attention they will receive. Loving media models, by contrast, prioritise critical analysis and creative discussion aimed at promoting understanding and peaceful resolutions. When we commit to love, we will – undoubtedly – encounter criticism from those who, echoing President François Hollande’s vow to ‘destroy’ Daesh, would have us respond to terrorism with violence. Love requires us to think of terrorists as people. It encourages us to understand that their actions – however hateful –come from a place of grievance. It asks us to believe that their pain, and the pain that so many other people are feeling in this time of terror, is not insurmountable. That collectively, we are able to overcome it.